Two years ago, I upgraded by 13 inch MacBook Air travel machine to a 13 inch MacBook Pro with Retina machine. And I liked it so much, I mostly stopped using my Mac Pro, instead doing my work on the MacBook Pro. As a consequence, I found myself freed from my desk. There is one major downside to portable computing: ergonomics. I’m tall, and laptops are tiny. Increasingly I found myself hunched over at a coffee shop, or curled up on a couch. Not good for my back or my neck. I recently purchased a solution, and it’s working really well. 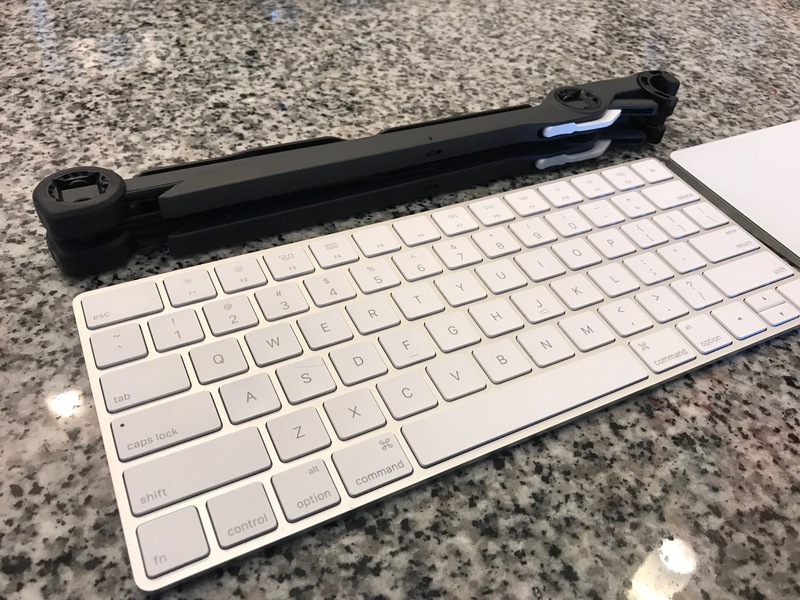 Setup is simple… just pull it apart with your fingers, insert the front edge of your laptop down into the clips, and then let the back of the laptop sit down. 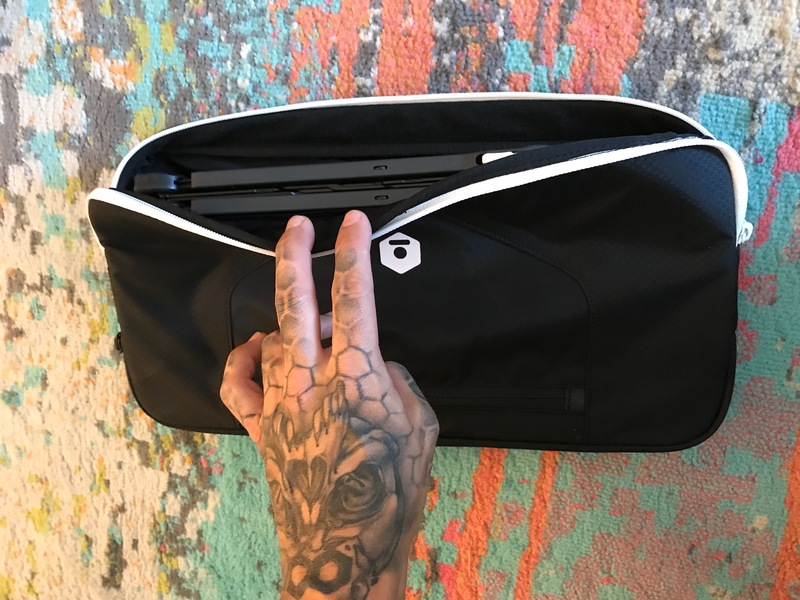 The clips are rubber, and rotate down as the laptop’s back-end is lowered, pinching the front edge quite effectively, and eliminating the need for any fitting. 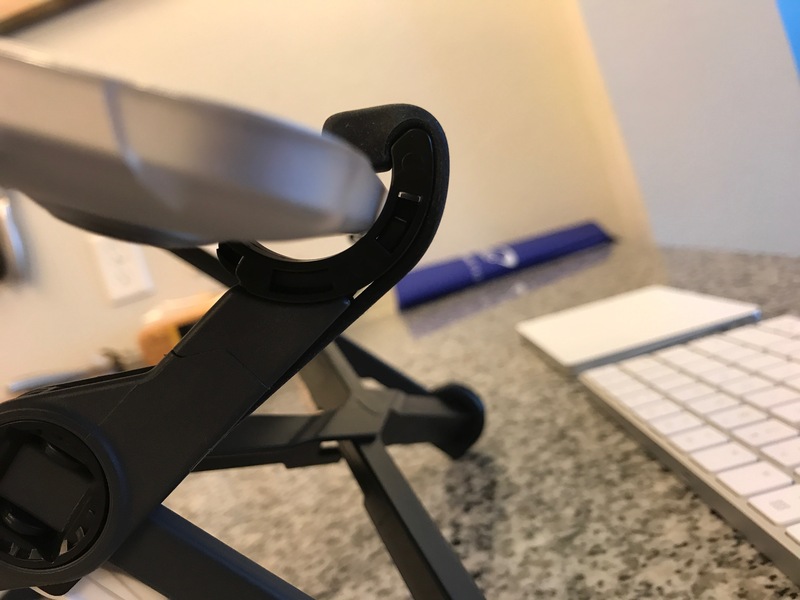 Once in place, the stand is quite stable. As long as the table under it is stable, you won’t need to worry about it. Setup takes about 20 seconds, from completely folded, to laptop in place and ready to work. Teardown is even faster. I decided to get the RKM carring case to carry my Roost, keyboard, and mouse trackpad (thus the “RKM”). The case is well made. It has a specific slot for the Roost, and a bigger compartment for your keyboard and mouse (or trackpad). That compartment is unnecessarily large for my Apple Magic Keyboard and my Apple Magic Trackpad 2, but it does the job. There is a zippered compartment on the outside that I keep a Lightning cable in, to periodically recharge the keyboard and the trackpad. 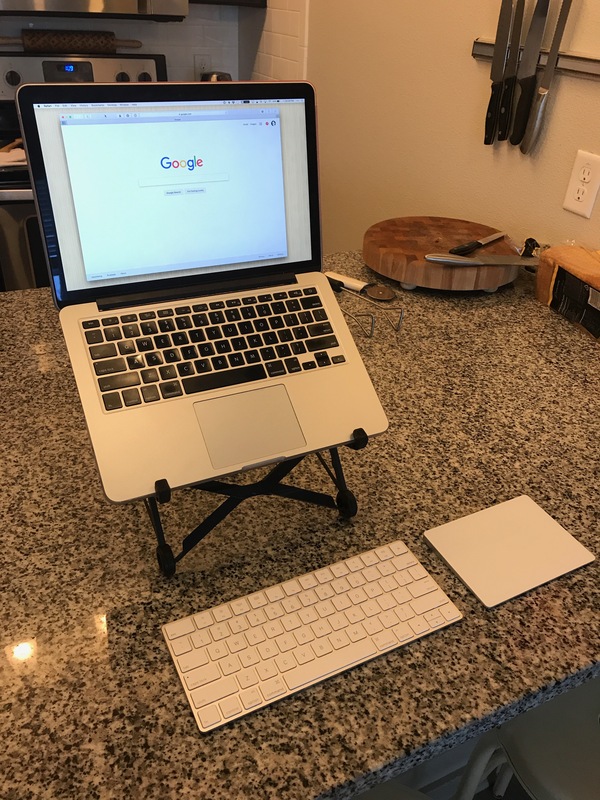 The stand is incredibly light: 3.2 ounces, so I just leave my RKM case with the Roost, keyboard and trackpad in my laptop bag all the time. 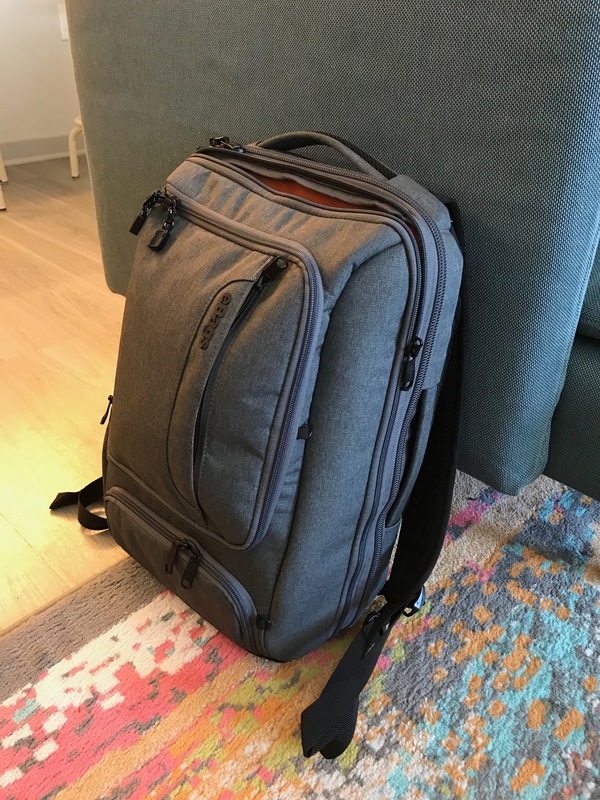 Speaking of my laptop bag, I switched to the eBags Professional Slim Laptop Backpack a few months ago, and am loving it. It has a ton of room, including a dedicated e-book/iPad Mini pocket, a padded main compartment, a Napoleon pocket, a hard case pocket on the bottom (good for glasses or anything that might get crushed), a small side pocket for keys and ChapStick, and a fold open compartment with a selection of zippered and slide-in compartments for cables, pens, and such. This is a great bag. Another thing I’ve found useful is keeping a dedicated power supply in my laptop bag. It’s best to minimize the number of things you’re taking in and out (ideally, it’s just your laptop). That way, you don’t forget anything, and the process of moving from place to place isn’t so annoying that you feel disinclined to move.